A keyring is used by everyone of us and its an item which we hold in hand almost everyday..isn’t it? our car keys to our drawer’s..there is mostly hanging a boring/simple type chain with any ring..it doesn’t seem so good, specially when you have a tiny space of creativity in your big head..haha.. well here while talking about myself I must be telling you about one thing first..Sometimes my creative job feels serious too.. want to know how?ok lets see how! whenever I have something simple in my hand(like a simple keychain etc. ), my family & friends taunt me in a fun way that I should be having my ordinary things in a more creative way..they all know me very well how lazy I am sometimes but see how they dont stop saying just to see something creative by Me..haha..so I laugh at their sweet taunt & words..and then it inspire & encourage me to try something creative with any of that simple thing.. So here today the keychain/keyring I am sharing is also a part of a story, once my keychain broke & I left the keys inside cupboard because I never lock my cupboard. when my friend saw that broken keychain, she ask me why not you make anything beautiful which will be looking more well at your cupboard lock place. So I thought I must be working on her suggestion now! 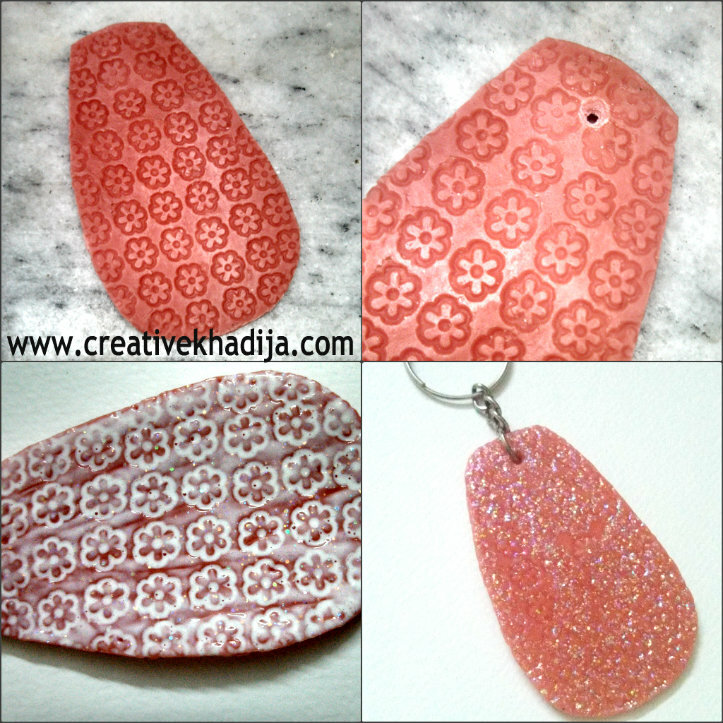 see what I have done & how I have made this keychain which can also be used as a pendant.. lets see.. This keychain is made of homemade dough, once I make some big amount of dough, I made so many little crafty thingies with that. This key chain is also a part of my homemade dough creations. 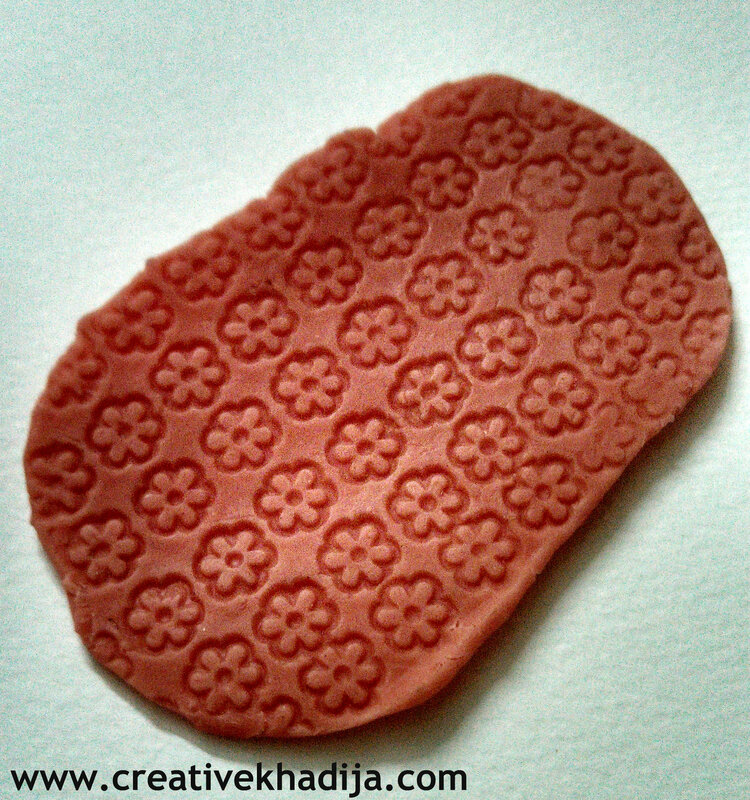 If you will remember, once I made a pearl & clay pendant with this engraved stamp texture design.. there some dough was extra & I make the texture over it but didn’t create anything with that piece. It was saved in my crafty space from a few months. so I tried to create this keychain out of that little piece. and the fun thing is, it can also be used as a pendant..isn’t it..? 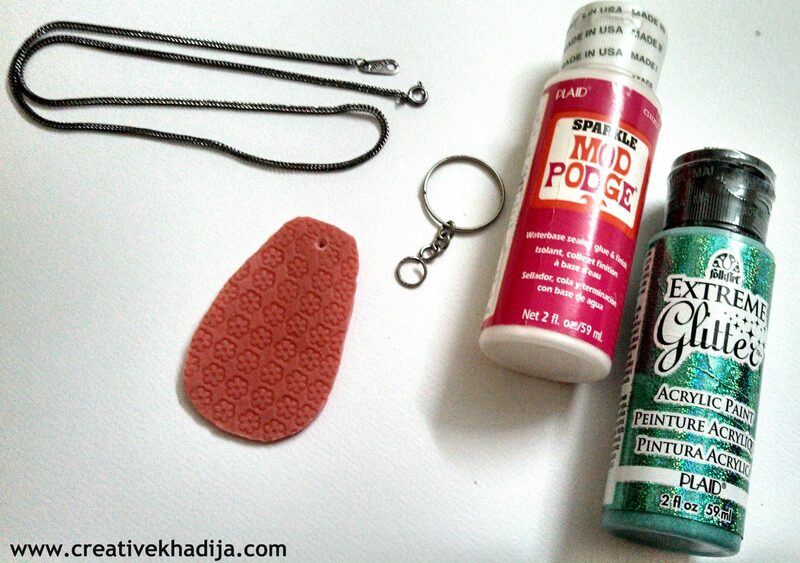 for making this clay/dough keychain, you will need to have some dough with the texture over it. then let it dry. First I cut the hard/dried piece of dough with scissors, and make any shape you would like. make a hole for adding the jump ring. 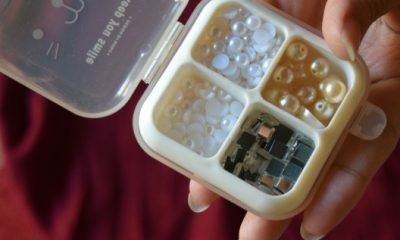 I did the hole with a nail screwier slim tip.then seal it with mod podge & when it will get dry, add the jump ring with the key chain. Here in the above image you can see the two options, Chain & Keyring both. its up top you how you create & what you create. a Keychain or a pendant. And the mod podge sealer is for sealing the piece. and glitter glue is for some shine. Make an outline with glitter glue. I use green, golden & red color glitter glue for making it more bling-ful.. and the turquoise rhinestone is for fixing in the middle. I use UHU adhesive glue for pasting. 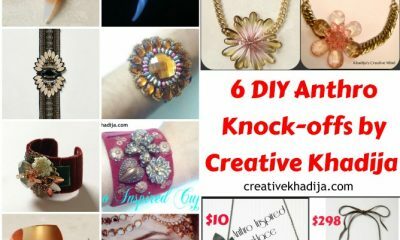 u can also use mod podge or any other transparent glue. Before washing the slim tip of the paint brush I apply this glitter paint on my nails, because I like nail paints.. so here it is a random click..
And the key chain is done! 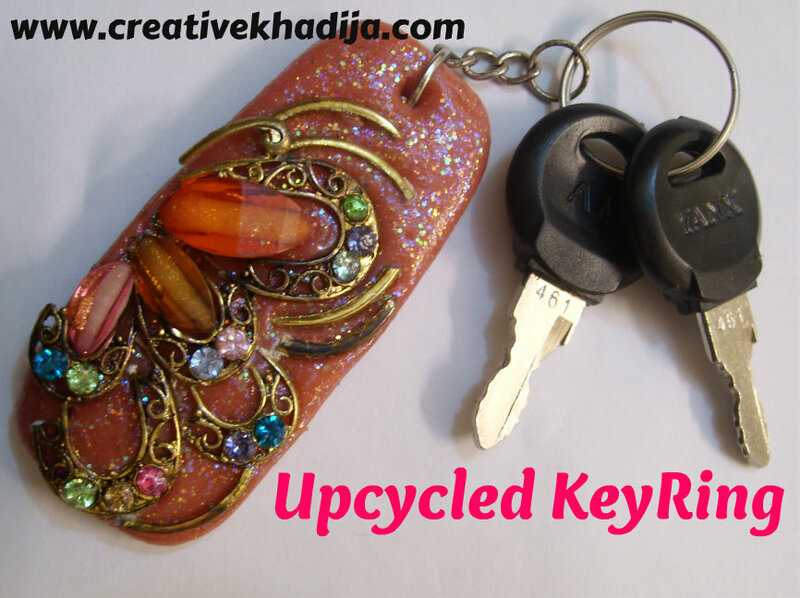 let it dry totally & fix your keys in the dough keyring.. a handmade keyring.. isn’t it fine? I think it would be a perfect gift as well, so this kind of handmade keyring will remind your friend about you whenever they will be holding & seeing the keyring at their place. I remember once when I was in grade 4, we made a flower ornament in our craft class. our teacher was having a simple keyring of her class table drawer. we class fellows decided to use it there. we attach that with our teacher’s keys..when she came in class she was looking at her keys(in fact searching) but when she saw that was with a ribbon ornament keyring, she became very happy! my teacher was super sweet.. Mrs. Zulaikha Yousaf.. how pretty & wonderful She was.. May Allah Almighty bless her with lots of blessings! 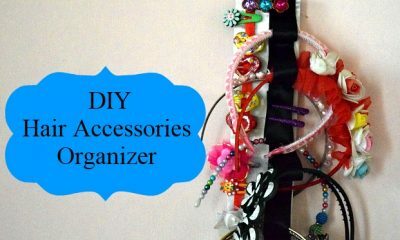 This is an easy idea of kids crafts or gift item. 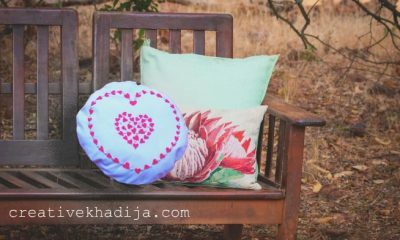 You can also gift these kind of little gifts to your family and friends, so whenever they will be seeing your handmade love.. they will definitely be appreciating your handmade stuff. so keep creating & keep giving these kind of easy gifts to your loved ones. sometimes less is always More..
Be happy & Have a wonderful day! 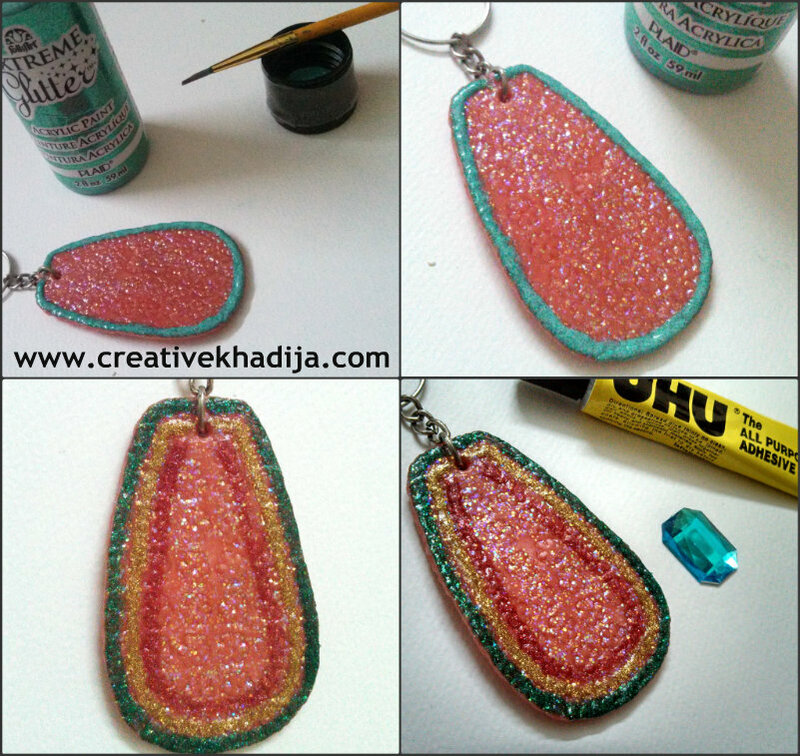 Itsy lovely Khadija..cool key chain :) Great idea..
love all the sparkles very pretty as well. Dear friend, I wish you Happy New year. Happy and creative. 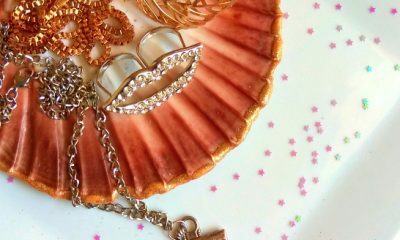 Pendants are so beautiful, I love colorfull things. What a neat idea. You did an excellent job on yours. Beautiful. Thanks for sharing on the Thumping Thursday bloghop. Very cool idea, love your creative work! This is a great idea, I love the way the key rings turned out. The upcycled one is adorable. Love your site, and visiting from Katharines Corner. Have a blessed weekend. fun! Thank you so much for helping to make the Thursday Favorite Things blog hop so much fun Hugs! 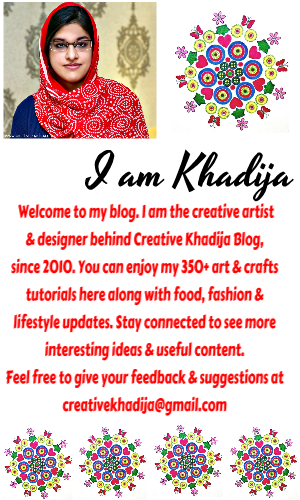 Thanks a lot for appreciating my key chain.. keep visiting & enjoying my craft ideas..
such a neat craft. It looks great. 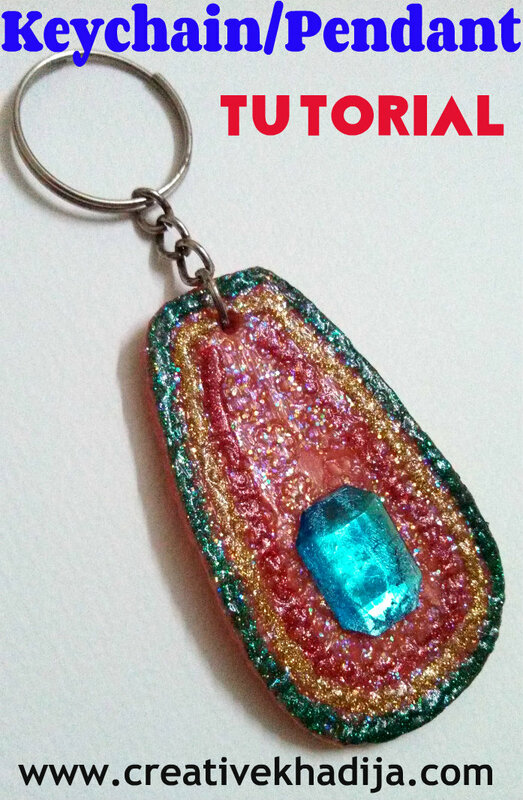 That’s one pretty key chain you made, and love the texture with the very pretty color. You always do such nice work. 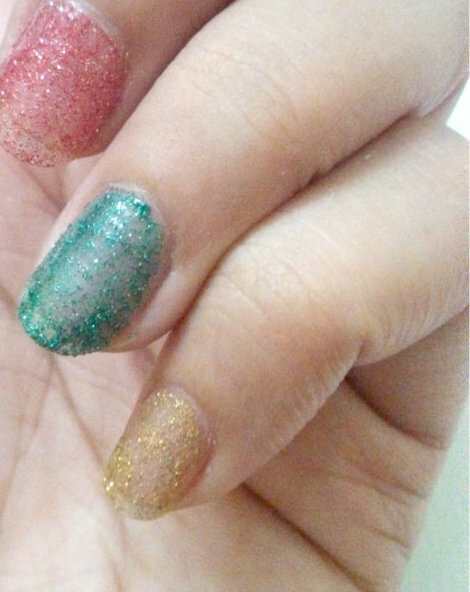 The glitter also looks pretty on your nails. I wanted to thank you for sharing this creative keychain at Sunday’s Best. I am now following you on Facebook….maybe you’ll follow me to! I love those colors! My daughter is big on sparkles. I would love to have you hop over and share with us at Tell Me About It Tuesday!